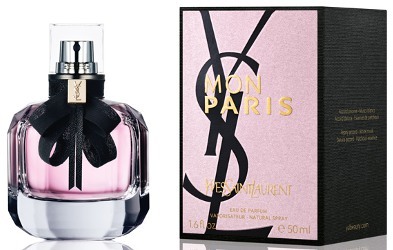 Yves Saint Laurent updated their 1983 classic rose, Paris, with Parisienne, a vinyl-accented modern rose, in 2009. I liked Parisienne, but I don't think it ever gained any sort of major traction with consumers despite the steamy Kate Moss advertising. So now for 2016 we have Mon Paris, which is "about vertigo, love that makes you lose your senses". The advertising features plenty of kissing, but little if any writhing, and Crista Cober keeps her clothes on — it takes Mon Paris a small step closer to the original underpinnings of Paris as a fragrance about roses and romance. There are no roses in the 2016 advertising, though, which is your first clue that Mon Paris, the juice, isn't an updated version of Paris, the juice. It's something entirely new, a "white chypre"1 or a fruity floral chypre with white musk, whichever terminology you prefer. It starts with plenty of fruit (raspberry, strawberry and pear, along with bergamot and calone), but the pear dominates, and the whole is relatively sheer and watery, so while it's juicy and berried and sweet, it has that more-clean-than-jammy feel that pear sometimes lends.2 Of the florals in the heart (peony, datura, jasmine, orange blossom), the peony is the main player, and again, it is kept at a relatively transparent level, so the overall feel is pink and modern and sweet, but clean. The "chypre" base (three white musks, plus ambrox and reportedly two kinds of patchouli, from Indonesia and Guatemala) is, in keeping with the modern style, likewise clean and pale, and while it's not quite so clean as to smell like detergent, it's still pretty darned clean, and the patchouli, whatever its exotic origins, is the usual molecular fraction that need not worry anybody. The lasting power is just fine. Verdict: Mon Paris is a wearable modern pink fruity floral, youthful and sweet. It is not so sweet as to cross over into the gourmand category (it is not as sweet or loud as Dior's new Poison Girl), and it is certainly not so passionate or sophisticated as its advertising (of course, few fragrances are). It is competently done, but the pink fruity category has not been neglected on perfume counters lately, and perhaps as a consequence, I found Mon Paris rather dull and faceless. It was probably a mistake to review it the week after Poison Girl — in a few more weeks, the two scents will be a big pink fruity blur in my mind. The same old same old cloyingly sweet fruit-punchy (chemical fruit) Eau de Mallrat. For my tastes, Mon Paris is 10X better than classic Paris & 5X better than Parisienne. IMHO, this series has gotten progressively much better -- with modern Mon Paris being best, by a landslide. Yves Saint Laurent Mon Paris was developed by perfumers Olivier Cresp, Harry Fremont and Dora Baghriche. It is available in 30 ($70), 50 ($92) and 90 ($122) ml Eau de Parfum. There is also a rollerball (10 ml, $29) and matching body products. 1. Stephan Bezy of Yves Saint Laurent Beauté told Women's Wear Daily (5/27/2016) it was a white chypre and says they invented this new category with Mon Paris. I propose a more accurate category name: the pink chypre. I'm afraid Yves Saint Laurent did not invent the pink chypre and offhand I couldn't say who did, but it's been around since at least Miss Dior Chérie, 2005. 2. For pear haters, and yes, I am among their number, the technical term is "pear shampoo". Probably. I don’t think it will have as many perfumista fans as Parisienne, although it’s likely to outsell that one by miles. Sounds like a fragrance for teenagers who is about to buy their first designer fragrance..a step away from the celebrity scents. That said, it doesn’t speak to me. At any kind. But it doesn’t offend me either. I was a bit “meh”, when I smelled it but must say, the bottle is cute. Really not how it’s intended, though — that would be Dior Poison Girl or YSL Black Opium. This is the next stage up, so will still smell young to anyone used to “grown up” fragrances, and certainly anyone who would wear the original Paris. Can’t argue with meh, though! Pink fruity says it all, no need to try this one. Somehow, this has made me feel sorry for Parisienne, which I now feel compelled to at least smell. Parisienne was not perfect and I never bought it, but I thought it was interesting and did a decent job of updating the original. I don’t quite find Paris unbearable, but it is too loud and blunt to wear regularly, that’s for sure. I’d still rather wear it than Mon Paris! I really liked the first 15 minutes of Parisienne (vinyl! cranberry! ), after which it settled down and got really boring. To my mind, this is a sign that we should all just go buy more classic Paris. Sigh. Parisienne was fun but could have been more fun. I am avoiding smelling new bottles of Paris because I assume it’s massively reformulated — but no idea if that’s true. It is, it’s not at all like it used to be. The current EDP is better than the EDT, but back in the day the eau de toilette was my preferred version. That’s what I figured. I have a little of the vintage, I will stick with that. I did really like some of the summer versions they did a few years back but don’t have any now. Money saved. Owning and loving Paris, I will pass on this one. Luckily, can’t see YSL ever discontinuing Paris. I wish they’d let chypre die. I love chypres and reading that word makes me hopeful. I tried Dior’s Gris Montaigne thanks to a wonderful perfumes and was totally disappointed. Likewise with Idylle, Miss Dior (Cherie)…. All these years later, I still don’t understand why they want to go on calling things chypres. I am going to adopt the term pink chypre, I think. Parisienne did well enough with consumers to be sold at Kohl’s*, and (thanks to a 30% coupon), I’m wearing it today. I actually smell more vinyl in Tocade. *American department store with a very limited selection of popular perfumes. Nice deal with the coupon! Just ordered a full (discounted) bottle of Jubilation 25. After reading this article I feel even more justified!